What is it Like to Experience a Wine? Last week, I described two kinds of judgment that constitute two forms of wine criticism. In one sort of judgment there is an actual property of the wine that is sufficient to justify a claim that the wine has some merit because the having of that property satisfies a norm. These norms are the sort of thing one learns when taking wine tasting classes—reasonable expectations about what a Left Bank Bordeaux or Mosel Riesling should taste like. These are reasonably objective judgments about the properties of the wine itself. The second sort of judgment I called judgments of appreciation. These are judgments not guided by the norms of the wine tasting community alone but are filtered through the personal tastes and sensibility of the taster. In this case the actual properties of the wine—the elegance of the Pinot Noir or the concentration of the Cabernet—are not sufficient to justify a judgment that the wine has merit because a wine with certain objective qualities nevertheless might not appeal to me. I argued that both kinds of criticism are necessary depending on context. This distinction is important because of a fact about human experience. We can be conscious of the sensory qualities of a wine—its flavor, aromas, tactile qualities, color etc. But in addition to being aware of these qualities there is something that it is like to be aware of these qualities. In other words, it’s one thing to identify a wine as having aromas of black cherry and mint. It’s quite another matter to focus on what it’s like to experience those aromas in a particular case. It feels like something to have a particular black cherry/mint experience. And it is this latter dimension of wine quality that explains why we fall in love with certain wines. By its very nature this “what it is like” to experience something is subjective. Or to use a more familiar example, you might love your spouse because of his or her sensitivity and courage. But you don’t love everyone who has sensitivity and courage. It’s an individual’s particular way of exhibiting those properties that we love. 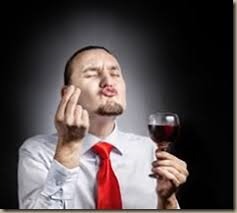 General features of lovers or wines cannot accurately describe particular experiences. We simply cannot capture the quality of a wine without this “what it is like” dimension, yet such judgments of appreciation are largely ignored in our tasting models that focus on aroma notes and mouthfeel. But what kinds of properties are we identifying when we try to capture this “what it is like” dimension? Just as a Beethoven symphony is not merely a configuration of sounds, but sounds that have musical meaning for the listener, a wine is not just a configuration of flavors and textures but flavors and textures that have meaning for a taster. Some of these meanings will be shareable and accessible to others. Beethoven’s symphonies are powerful and dynamic. Similarly, a wine might exhibit clarity, focus, and intensity. But these judgments based on complex perceptions cannot be in the wine or the music itself if only because they involve comparisons with other wines or musical works and thus depend on the experience of the perceiver. Yet in both the music case and the wine case, features such as “powerful”, “dynamic”, “clarity” and “focus” will depend in part on objective features of the wine. Something about the wine will explain why we have these perceptions. The property we identify is the product of a complex interaction between the wine and a perceiver. Some wine tasting notes will incorporate these qualities despite the subjective element. But what about the next level of description? Beethoven’s symphonies have often been described as heroic, depicting struggles, defeats, and the ultimate overcoming of obstacles to achieve victory. Obviously these are no longer strictly musical meanings. We are in the realm of imaginative story telling here. The roiling feelings we experience when listening to Beethoven gives us clues about what the appropriate story might be that captures the way the music feels. But neither the story nor the feelings exist outside one’s subjective state, the “something that it’s like” experience of the music. Yet even with these fundamentally subjective experiences there are features of the music itself that guide the judgment that a symphony is heroic—dynamic and powerful would be candidates. By contrast, it would be perverse to describe a Haydn string quartet as heroic. Something similar is at work when we appreciate abstract art. We tell stories about meanings and have complex affective reactions to them even though the work is not representing anything and is not depicting a scene or narrative. If we use our sensory experience to find meaning in music and abstract, non-representational art, why not in wine? Only by doing so can we capture the full dimension of “what it is like” to experience a wine. In describing wines in my reviews I find it necessary to use emotions, personality characteristics, forms of motion and musical works to capture what it is like to experience a wine. No recitation of aromas or flavors will capture the essence of a reasonably complex wine. I suppose one objection to such imaginative tasting notes is that wine, unlike music or abstract art, lacks the richness of information that would provide a foundation for such judgments. I doubt this is true but will leave that argument for another day.